Words appear in the mind -- bursts of electrical energy flash within a network of tissue. Bursts of electrical energy pass through networks of tissue as we write or type the letters. In this way the Divine becomes manifest, the ephemeral tangible. This reading is the final follow-up for the previous two. I decided to ask one more question. I wanted information about the Prince of Swords from the very first reading, who showed up as a the Future card. The Prince of Swords represents the airy part of Air, which is associated with our Intellectual Mind. Did this mean I would find intellectually stimulating work? Did it mean that I can manifest anything I put my mind to, and what am I waiting for? Did it mean that I am lost in "too much thinking" about it without enough "doing"? 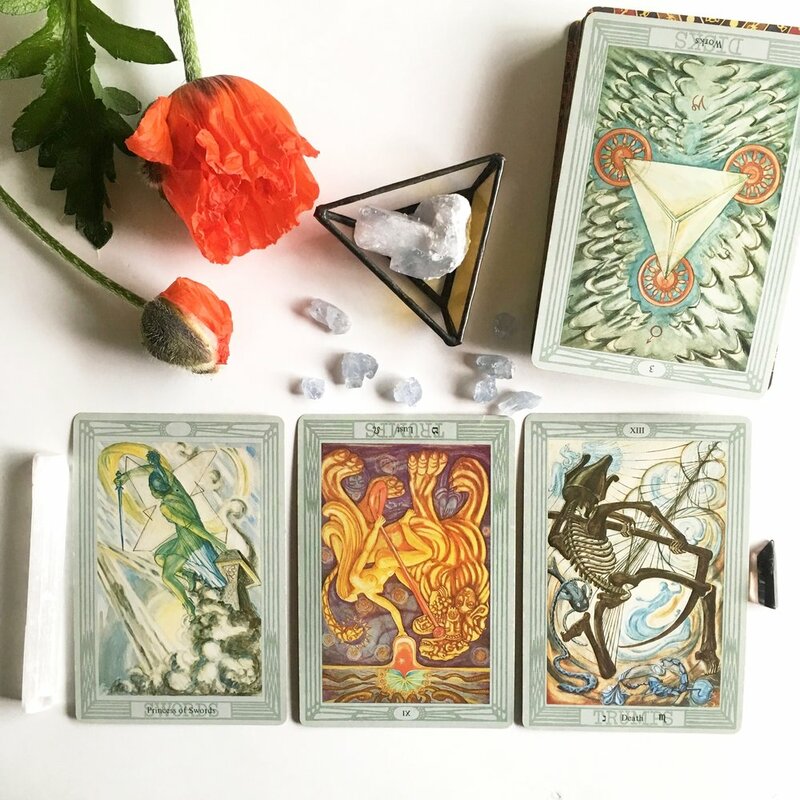 After we finished drawing cards and photographing the Influence card reading, I picked up the cards, and as Alia removed the props, she noticed a small, triangular dish that she had forgotten to use, and she cried out, "I really wanted to use this!" I shuffled the cards, still at the white table, and I focused on the Prince of Swords and wondered what it was supposed to mean. Three cards fell out of the middle of the deck. I stopped shuffling and put down the deck. I spread the three cards that had fallen out and flipped over the top card on the deck. It was a reversed Three of Disks, named Work. The card representing the Past here is the Princess of Swords, the card that follows the Prince of Swords (the card I had asked about), and in some respects the Princess his twin. The Princess is the earthy part of Air: the volatile has become fixed. The Idea has materialized. The card here representing the Present is Atu XI, Lust. This card describes the magickal doctrine of the New Aeon. A naked goddess astride a lion serpent. It describes courage, love, strength, and energy. Leo is the Kerub of Fire and represents Fire at its highest form. This card advocates the use of the magical power of love. It's a very powerful card. The fact that it's reversed may imply I'm not using my Love [of Work] correctly or that I'm subverting myself somehow. I could place the blame outside myself, and say someone is subverting me, but ultimately I know this manifestation is my own doing. The Death card, Atu XIII, sits in the place of the Future. This card implies rebirth and regeneration (the fish and the snake) and sacrifice (the scorpion). It represents a sudden, expected change. In The Book of Thoth, Aleister Crowley says the Death card is the completion of the Lust card. That's hopeful, at least! In the Future I will complete my Work. I use the Influence card as a filter on the reading. Since the reading was focused on the Prince of Swords to start with, there was already that layer. Now, the Three of Coins has something to add. Called Work, the Three of Coins is attributed to Mars in Capricorn, and it has a very constructive energy. True to its name, this card implies work is being done. In this reading, however, this card is shown reversed, so the work may not be in progress, or else it may be in vain or ineffective. It's interesting to me that the question concerned employment, and the card called Work was drawn. As I continue using my new deck, I'm curious to see how they work when reversed. For example, when the Three of Coins is reversed, it looks similar to the Three of Swords, but does the meaning follow the Three of Swords or the reversed Three of Coins? What if the cards are turned left or right? I made them square to test my hypothesis that the direction does matter. I took from this reading a sense that I am spinning my wheels. The Prince of Swords, I now believe, indicated that I need to work harder and to focus. With both the Influence card and the Present card reversed, it may be time for me to develop a real game plan and to set some goals. This was a good example of how a reading can be influenced by the subconscious mind of anyone present, whether it's of the person doing the reading or of the querent. Maybe the mark of a good reader is someone who can clear their mind and let the querent’s subconscious mind shuffle the cards. I suppose some tarot readers have the querent shuffle the cards, but I never let anyone else touch the cards. I believe that better allows me to act as facilitator. Looking at the cards is like reading a character sketch of the person. There is as much in those four cards about the person as there is about the question or the answer.